It's Open Day at Greenway House. The former holiday home of Agatha Christie (now a National Trust property) has thrown open its doors to the public for one day only. The house and gardens are normally out-of-bounds outside April to October. It's a great opportunity for us to investigate the gardens for new discoveries. There are different species here. Our old friend Flavoparmelia Caperata is present in the centre of the picture. There are scattered black spots on the upper surface. Perhaps this occurs with older specimens. Elsewhere there are a couple of examples of Parmelia saxatilis. They are slightly crimped and the tips of the lobes are tinged brown. It's also possible we have a third species: Hypotrachyna afrorerevoluta. 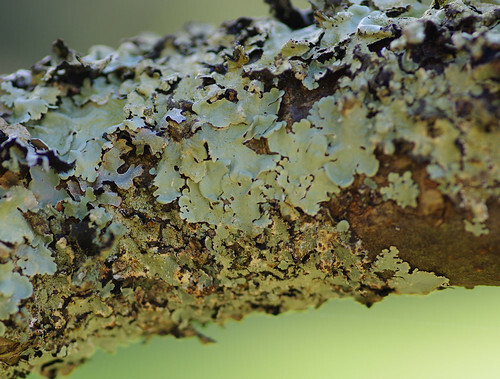 These lichens were densely clustered together, growing on the branch of an apple tree that had been trained horizontally. Judging from their appearance they could well have existed here when Agatha Christie was alive. 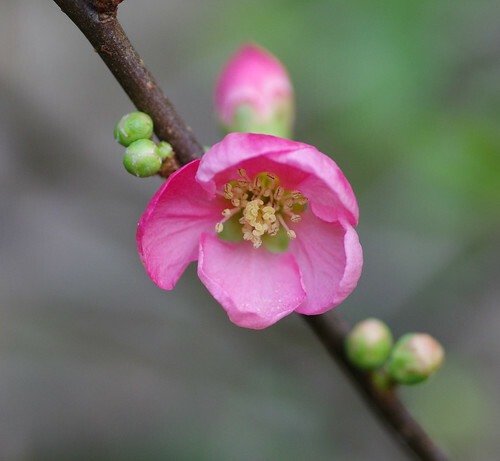 At any time of year there is bound to be something in bloom in a National Trust garden. Flowering plants are staggered throughout the year to provide an attractive display. 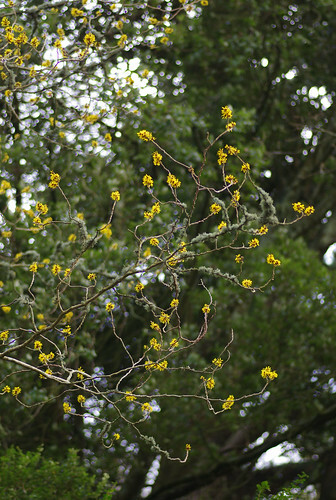 The Wych Elm is one of the first trees to blossom every year. Due to the relatively mild climate (compared to many other areas of the U.K) this tree is ahead and in flower at the end of December. 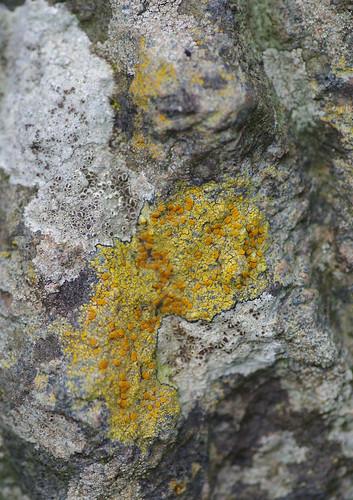 The irregular yellow thallus with discs in the centre of the picture is a Caloplaca species. I think Caloplaca ochracea is the most likely candidate. 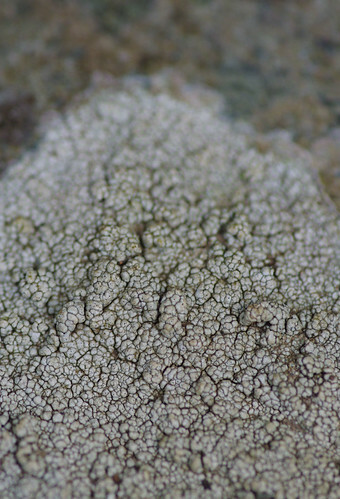 The thin black edges (the prothallus) probably belong to the white thallus species with brown discs to either side. 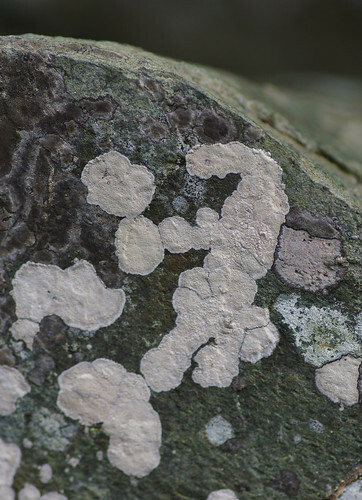 The nearest match I can find is Lecanora campestris but this species has a white prothallus. There was also some unwelcome lens distortion, probably due to the irregular contours of the rock. Here is another part of the same rock. There are other species present on this section. 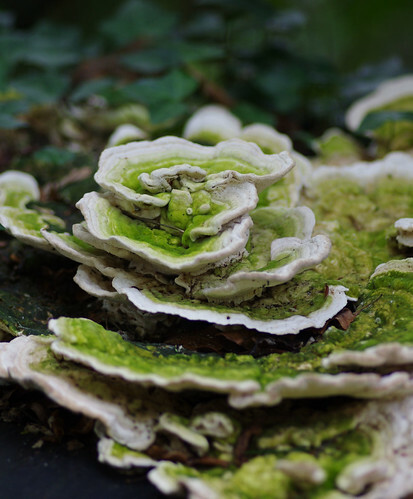 As we leisurely wandered around the gardens, other things grabbed our attention. I have seen this recently in roadside hedgerows in nearby Churston. I am presuming this is an elm branch and the effect has been produced by beetles carrying Dutch Elm disease. This pattern has been produced by a fly. The fly lays its eggs on the leaf. The larvae then eat their way out causing discolouration in the leaf. There are many species in the UK affecting a wide variety of trees and flowers. 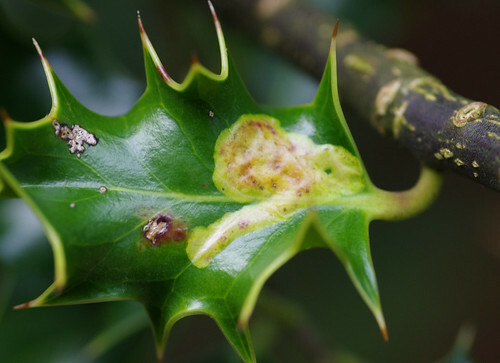 If you see a strange blotchy pattern on a leaf the chances are it has been produced by a leaf-mining fly,wasp or midge. 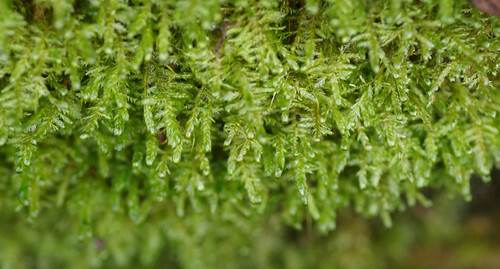 The dusting of green is due to algae, suggesting these are relatively mature specimens. This species is frequently seen on fallen hardwood trunks. 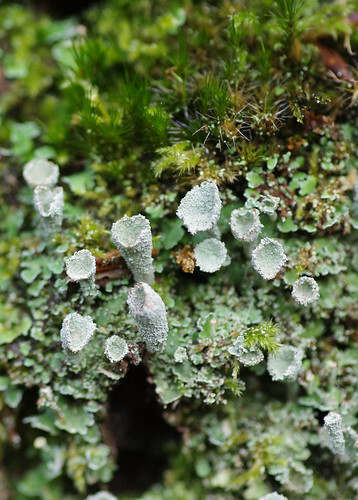 Another Cladonia species. It looks similar to the one we saw in a cemetery a couple of weeks ago. 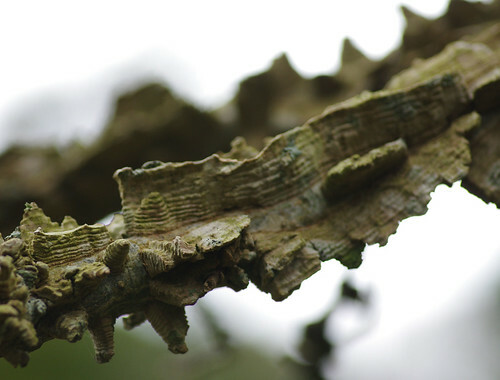 So I'm opting for Cladonia chlorophaea as a matter of course - even though technically a microscope and chemical testing are required to arrive at a positive identification. These were by the side of the path between the boathouse and the main house. We got a few odd looks from people wondering why we could possibly be so fascinated by tiny green things in the soil. Just past the boathouse there was also a small platform with views of the river. The rocks there had more lichens we had not captured before. The one on the right is olive-coloured with a nobbly texture. The combination of these distinctive characteristics should theoretically make it easier to identify. And here is a close-up of the same species. From this magnified level it looks slightly paler and it is evident that the surface is cracked in places and slightly uneven. 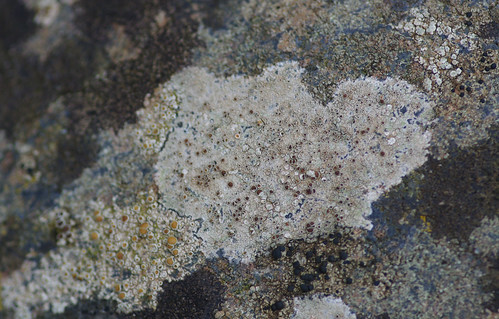 Pertusaria pertusa appears to be the nearest match although it is by no means identical. There are a few holes within each wart, whereas the warts above possess one or two at best. 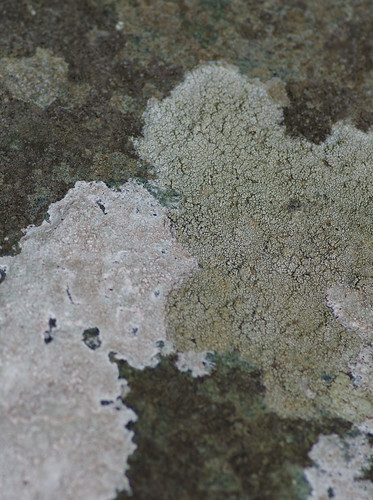 The lichens here are almost flush to the surface of the rock. And there are other darker specimens, barely visible to the naked eye. After we rejoined the path we noticed many mosses growing at foot level before reaching the main drive and walking along it. It had been another bumper day for miniature things. While they might be tricky to identify it is always a pleasure to see new things. And like Gulliver in Lilliput seeing things this close and small lends everything an altered and an enlightened sense of perspective.